Quantum Internet Solutions Ltd. Provides VOIP Phone Systems for Home Starting At Just $20.00+GST per User per Month! Call Quantum Internet Solutions Today To Find Out More! Communication on the IP network is perceived as less reliable in contrast to the circuit-switched public telephone network because it does not provide a network-based mechanism to ensure that data packets are not lost, and are delivered in sequential order. It is a best-effort network without fundamental Quality of Service (QoS) guarantees. Voice, and all other data, travels in packets over IP networks with fixed maximum capacity. This system may be more prone to congestion and DoS attacks than traditional circuit switched systems; a circuit switched system of insufficient capacity will refuse new connections while carrying the remainder without impairment, while the quality of real-time data such as telephone conversations on packet-switched networks degrades dramatically. Therefore, VoIP implementations may face problems with latency, packet loss, and jitter. Network routers on high volume traffic links may introduce latency that exceeds permissible thresholds for VoIP. When the load on a link grows so quickly that its switches experience queue overflows, congestion results and data packets are lost. This signals a transport protocol like TCP to reduce its transmission rate to alleviate the congestion. But VoIP usually uses UDP not TCP because recovering from congestion through retransmission usually entails too much latency. So QoS mechanisms can avoid the undesirable loss of VoIP packets by immediately transmitting them ahead of any queued bulk traffic on the same link, even when that bulk traffic queue is overflowing. VoIP endpoints usually have to wait for completion of transmission of previous packets before new data may be sent. Although it is possible to preempt (abort) a less important packet in mid-transmission, this is not commonly done, especially on high-speed links where transmission times are short even for maximum-sized packets. An alternative to preemption on slower links, such as dialup and digital subscriber line (DSL), is to reduce the maximum transmission time by reducing the maximum transmission unit. But every packet must contain protocol headers, so this increases relative header overhead on every link traversed, not just the bottleneck (usually Internet access) link. The receiver must resequence IP packets that arrive out of order and recover gracefully when packets arrive too late or not at all. Jitter results from the rapid and random (i.e. unpredictable) changes in queue lengths along a given Internet path due to competition from other users for the same transmission links. 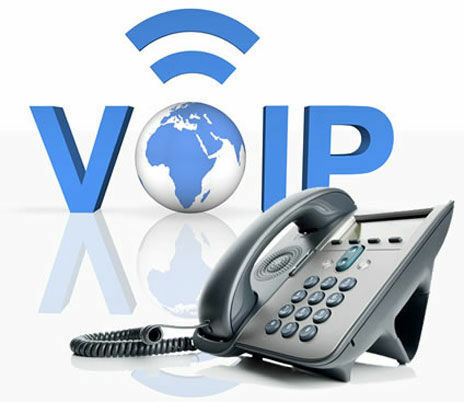 VoIP receivers counter jitter by storing incoming packets briefly in a "de-jitter" or "playout" buffer, deliberately increasing latency to improve the chance that each packet will be on hand when it is time for the voice engine to play it. The added delay is thus a compromise between excessive latency and excessive dropout, i.e. momentary audio interruptions. Although jitter is a random variable, it is the sum of several other random variables which are at least somewhat independent: the individual queuing delays of the routers along the Internet path in question. According to the central limit theorem, jitter can be modeled as a gaussian random variable. This suggests continually estimating the mean delay and its standard deviation and setting the playout delay so that only packets delayed more than several standard deviations above the mean will arrive too late to be useful. In practice, the variance in latency of many Internet paths is dominated by a small number (often one) of relatively slow and congested "bottleneck" links. Most Internet backbone links are now so fast (e.g. 10 Gbit/s) that their delays are dominated by the transmission medium (e.g. optical fiber) and the routers driving them do not have enough buffering for queuing delays to be significant. A number of protocols have been defined to support the reporting of quality of service (QoS) and quality of experience (QoE) for VoIP calls. These include RTCP Extended Report (RFC 3611), SIP RTCP Summary Reports, H.460.9 Annex B (for H.323), H.248.30 and MGCP extensions. The RFC 3611 VoIP Metrics block is generated by an IP phone or gateway during a live call and contains information on packet loss rate, packet discard rate (because of jitter), packet loss/discard burst metrics (burst length/density, gap length/density), network delay, end system delay, signal / noise / echo level, Mean Opinion Scores (MOS) and R factors and configuration information related to the jitter buffer.